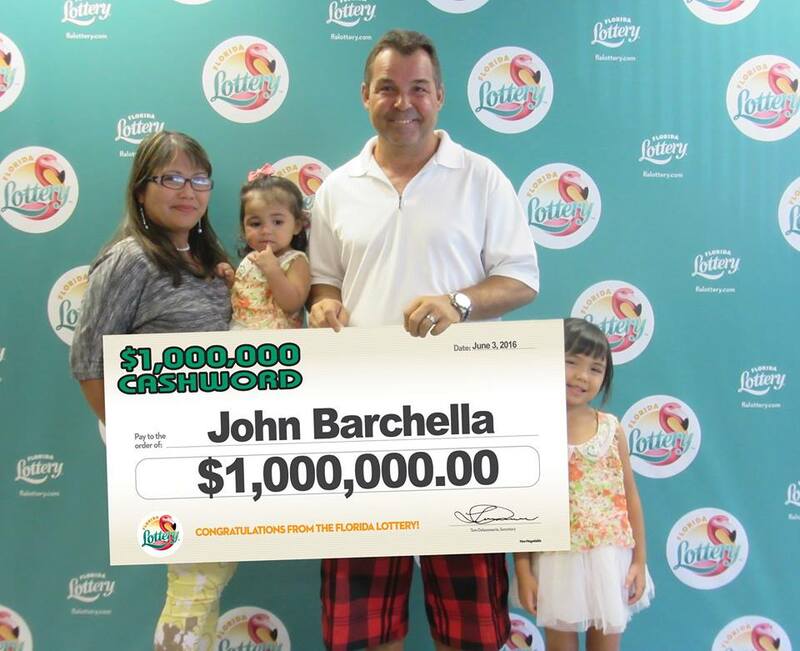 PALM BAY, Florida - The Florida Lottery announced that 53-year-old John Barchella, of Palm Bay, Florida, claimed a top prize in the $1,000,000 CASHWORD Scratch-Off game at Florida Lottery Headquarters last month in Tallahassee, Florida. He chose to receive his winnings as a one-time, lump-sum payment of $760,000.00. Barchella, who recently retired from the Army after 21 years of service, said he went into the store to buy one ticket but changed his mind at the counter and decided to buy two tickets; one for himself, and one for his wife. "I decided at the last second to buy two tickets instead of one, and the second ticket actually turned out to be the big winner! I just feel so blessed," said Barchella. He purchased the winning ticket from a 7-Eleven convenience store located at 3505 Bayside Lakes Boulevard in Palm Bay. The retailer will receive a $2,000 bonus commission for selling the winning Scratch-Off ticket. The $10 Scratch-Off game, $1,000,000 CASHWORD, was launched by the Florida Lottery on May 17, 2016, and features eight top prizes of $1 million and more than 2.9 million winning tickets. The overall odds of winning are 1-in-3.39.